•Charles Brickley was a coach at Harvard. 11/6   W 27-7        Brooklyn All-Star Collegians (H)  1,000  [Jimmy Jemail's All-Stars] 27-6? 11/26  L  0-14    at Orange A.C. Tornadoes, at Ashland Field [Independent Championship of New York] or L??? 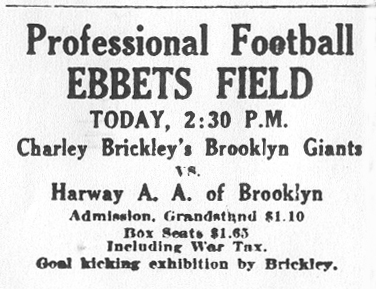 •Charlie Brickley coached the U.S. Navy Port of Embarkation Depot football team in 1918. 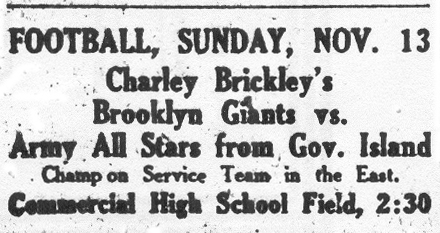 °Charlie's brother George Brickley also had an All-Stars team, c. 1922.